Wisdom teeth time ? 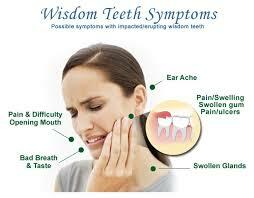 Having Wisdom tooth Pain ? These teeth are thought to be called ‘Wisdom teeth’ as they erupt later in life when people are wiser.They are also called as third molars and erupt at the rear corner of the mouth. These normally appear when people are in their late teens or early twenties. It isn’t uncommon for some to never get them or some people to experience no pain when they get them. To some it causes great amount of pain if there isn’t enough space for these to erupt. Partially erupted wisdom teeth add pressure and push the other teeth causing constant pain and infection in some cases. In order to avoid this pain or risks, regular visits to your dentist who will examine if your wisdom tooth are emerging and if it requires removal is common. A dentist can help you with wisdom tooth extraction or will refer you to a specialist oral surgeon in case of a any complicated case (like, if tooth is too close to a nerve). Wisdom tooth extraction is very common as most of us go through this at some point in time in our lives. The extractions are done by giving patients local anaesthetic so that they experience no pain during the procedure. The recovery period is around a week during which the painkiller are usually prescribes by the dentist after the procedure. However, precaution needs to be taken during this time in terms of brushing and eating solids. Whilst this process has minimal risk, the dentist at NW1 Dental care will brief you on your case and any risk if involved so that you are informed and soon get back your health smile !